The 1500 bones and bone fragments represent at least 15 individuals. The 15 individuals include infants, children, and adults. The brains of the adults are small (460 and 550 cc). Compare this to modern man (1350 cc average), Homo erectus (865 cc) and chimpanzees (350 cc average). The adults were about 5 feet tall with bones that have a mosaic of features of human (Homo) and australopithecines. The cavern in which the fossils were found has only fine sediment and no evidence of water transport of material from any outside source. The presence of only hominin bones, the lack of any marks on the bones from predators or cannibalism, and restricted access to the cavern have all been interpreted as the result of intentional deposition of bodies. The bones/bodies appear to have been deposited over “some period of time,” rather than at one time. So far, artifacts such as stone tools, clothing, or charcoal have not been reported as present in this chamber. Providing a hypothesis that accounts for the data above is no easy task. We can be sure these bones represent real living beings that lived in a real place in the past, but they certainly looked different from anything alive today. Beyond that, many questions immediately come to mind. Who did these bones belong to? How did they come to be preserved in such an isolated cavern? What relationship do these individuals have to organisms that are alive today? How long ago did they live? For many Christians, the revelation of yet another set of strange bones raises additional questions. These bones have come to light at a time in which the evangelical Christian church has a heightened interest in origins, especially the origins of human beings. The historicity of Adam and Eve is a hotly debated topic today, and these fossils will certainly become part of any future discussions. Where do the owners of these bones fit into the chronology of creation? Did they have the “image of God,” as Adam did? If they purposely disposed of their dead, is that a sign that they were religious, self-conscious, or even “human”? Do these bones challenge the special creation narrative of YECs? Christians who maintain a particular reading of Genesis that requires the Earth and Universe to be physically young will have a special interest in these questions. These fossils and their location and arrangement bring new challenges to their particular view of cosmic history. Let us look at how the YECs have responded thus far and explore the future challenges they can expect to encounter from these findings. Whatever species these bones represent—and we will be publishing a more complete report on the discovery and the claims being made about it soon—we know that they cannot be any sort of intermediate between apes and humans. The only way to find an ape-man—or a “bridge” between apes and humans—is to misinterpret fossils of either an ape or a human as something in between. But all humans—even varieties of humans that we no longer have with us—were all descended from the first two people God made. … can say with confidence that this discovery changes nothing about our understanding of human history. You see, the only eyewitness account of human origins is the one provided by God our Creator in the Bible’s book of Genesis. No scientist witnessed the origin of man, and evolutionary scientists only believe there were intermediate evolutionary links between an ape-like ancestor and man because they have disregarded God’s Word and substituted their own fallible opinions in its place. This is the type of response we should expect given the commitments that YEC have to their interpretation of scripture. Ken Ham is confident that any fossil find must belong either to the human species (which means that they have to be descendants of Adam and Eve) or to primates. All hominins are either fully human or fully ape. There is no in between. That’s a question that Ken Ham can’t answer himself since he has little education in the science, especially anthropology, and the Bible doesn’t tell him about these specific set of bones in South Africa. So he must rely on his network of trusted “experts” to decide if these bones are animal or human. In this case, that expert is Dr. Elizabeth Mitchell, MD, and she was tasked with writing the response to this discovery. That response only took one day to complete—a very fast analysis indeed—and much to my surprise she has decided the bones are of animal origin. Yet while the fossil record contains many legitimate examples of extinct varieties of humans, such as Homo erectus and Homo neanderthalensis, after assessing the published reports, we beg to differ with Berger’s assessment of Homo naledi. We do not believe Homo naledi deserves its Homo designation. We know that God created man and land animals the same day without evolution. We seriously doubt the original owners of the Dinaledi bones were among the descendants of Adam and Eve, as the preponderance of the evidence suggests they were animals, one of the variations that developed among apes. I am not convinced that H. naledi is human, and I don’t recognize the status of “near human.” From what I can see from the fossils and skull reconstruction, H. naledi had a sloped lower face and a very robust mandible that bears little resemblance to humans. It also has a small cranium. The proximal and medial phalanges of the hand are even more curved than Au. afarensis, suggesting an ape-like creature. So with little reservation, Dr. Mitchell has proclaimed these bones to be nothing more than the remains of a group of unfortunate animals. Before we look closer at her reasons for this opinion, let’s see if other young earth creationist agree that it is clear that they are just animal bones. We predict, on the basis of the creation model, Homo naledi too will become just one more dead end in the questionable human evolution parade. In fact, the story itself is rife with caution, unanswered questions, and speculation. 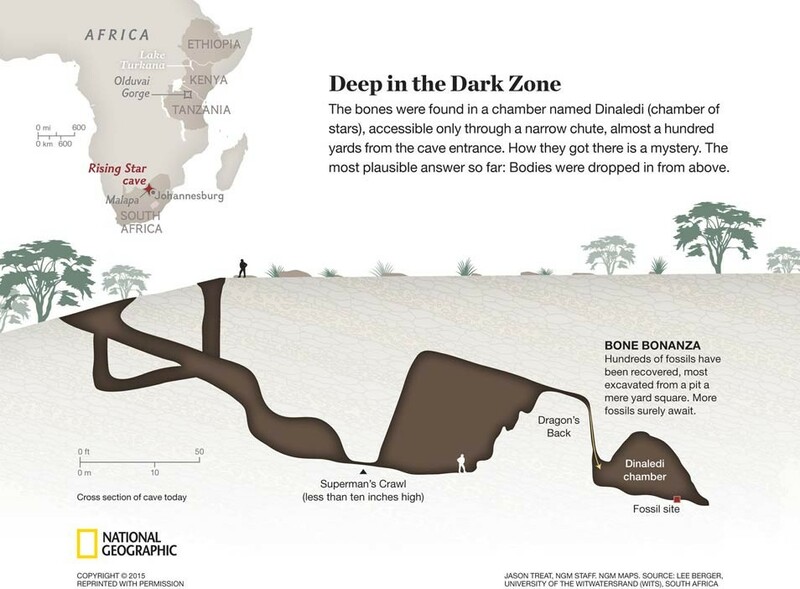 The 15 partial skeletons were found buried in a difficult-to-access South African cave. Their human feet and skulls, plus ritualistic burial, show that Homo naledi—if this name stands the test of time—was likely just another human variety. We wait to see what becomes of Homo naledi with further research by secular scientists. I think I know the answer! This is a relatively safe response, given the more human-like aspects of the bones such as the head shape, features that allow for bipedal locomotion, human-like feet, possible purposeful deposition of bodies, and tool-using hand shape. Also, though his response allows for further exploration and study, his initial reaction is that these are human beings and that scientists are just trying to make it seem like this is an intermediate link between humans and apes by accentuating the ape-like features. Sherwin refers to “dead ends.” What he means by this is that these hominins are just a lost human lineage, perhaps, which dispersed from the Tower of Babel; or they are apes that dispersed from Noah’s ark, leaving no living descendants today. The former is what Sherwin believes the bones of Homo erectus, Homo floresiensis (the hobbit) and Homo neadethalensis all represent. It follows then that these bones in South Africa also might just be another divergent lineage of Noah’s descendants. UPDATE 9/17/15: Mr.Sherwin has just updated his article and moved to the position of Ken Ham: “Upon closer examination, the skeletal remains given the name Homo naledi show a host of primate characteristics, and evolutionists have pointed out shortcomings with the ritualistic burial interpretation.” With this change, I expect now that most other major YEC organizations will produce similar statements. “I think the case is very strong that these fossils are not just of the genus Homo, but are actually fully human (meaning they are descendants of Adam and Eve),” said Kurt Wise, director of the Center for Creation Research at Truett-McConnell College. Wise noted that early humans dispersed after the biblical Tower of Babel incident would have lived in isolated populations and developed highly distinct traits. They can’t both be right, especially since they believe that intermediates are impossible. The comments on Ken Ham’s Facebook page are mostly uninformed about the original findings, many of them amounting to knee-jerk reactions to headlines. Looking through hundreds of those comments creates the impression of great confusion. Some commenters are sure these bones are just another variety of humans while others are sure they are just apes. I have yet to see any supporter of Ken Ham advocate for a “wait and see” approach to the data. So Ham’s push to produce a quick judgment would seem to be justified from a marketing perspective. The problem here is that these “remains” are clearly fraudulent. Monkeys who burry their dead and make fire? What utter nonsense. This fits right in with the long line of fakes and frauds, planted by the devil or atheist so-called-“scientists” to confuse the weak of faith or intellect. I will pray that God and AiG continue to point out the betrayals of science and satan, and bring the truth and the light to the ignorant and the deceived. Maybe this comment is hyperbole or sarcasm but there are many that express similar thoughts to some extent. Some level of fraud is not an uncommon reaction to evidence of an old Earth or common ancestry among many adherents to young earth creationism even if this is not the position that any of the leaders of that movement take. But, the extreme skepticism or outright dismissal of all findings of historical science that Ken Ham and other has promoted over the years has created a subculture within their community in which even the basic facts are greatly distrust and thus conversation is made very difficult. Taking time to let the scientific process play out? He was exactly right. It was unlikely that Ham could afford to be ambiguous about the bones. Creationists are bound to pick sides quickly and then declare rather definitively how a new find confirms their pre-existing views. Contradictory data and observations will be swept under the rug, and memes will be constructed to entrench viewpoints in their followers’ minds. This is unfortunate and dangerous because it discourages real discussion. Make no mistake, this is a discussion that deserved to be had because this won’t be the last time that Christians are confronted by new and strange data that doesn’t easily fit into neat and tidy interpretative frameworks. I’m currently writing up my results, but unfortunately for you, I won’t be spoiling them here. I’m a firm believer in peer review to make sure I’ve done my due diligence. I will be submitting my manuscript for formal publication in a journal, and until then, I’m going to keep a lid on things. In the mean time, though, I wanted to offer a few additional thoughts. I think this is a very wise approach and is to be commended. There is much to consider and a deliberate approach is needed in which all hypotheses are explored, tested, then tested and sifted by the peer review process. But I understand why creationist’ organizations such as Answers in Genesis feel the need to immediately “answer” every question that their constituents have. Telling their readers and donors that they don’t know if these bones are animals or humans will rarely look good, at least in the short-term. After all, these organizations argue all the time for the great gulf between man and animals both in behavior, culture and biology. Given the huge collection of hominin bones found in the South African cave, the condition that they are in, and the public awareness of them it would be very difficult for creationist organizations to convince their audiences that they can’t tell if the bones are humans or animals and that they should wait for a few years for a thorough analysis. Boldly labeling a fossil find as animal or human is a risky move for creationists, and so the decision to go one way or the other I am sure has not been taken lightly. Personally, I thought that Dr. Mitchell and the Answers in Genesis team would choose the animal option, although it would be better for them to choose the “fully human” option. Why? Not solely because of the similarities with other hominid species or, if you prefer, “races.” No, I thought they should go with “fully human” because it would have been a safer position to take and there was precedent for making the claim that these were bones of individuals who “lived in isolated populations and developed highly distinct traits,” as Dr. Wise has said. Why do I say that “human” was the safer choice? Because there is so much more yet to learn about this cave and its inhabitants! There is little we could discover that would add weight to the view that these were only apes, but there are so many things that could be found that could swing the evidence in favor of the “fully human” for the creationist position, as AiG understands human origins. For example, what if charcoal is found in the cave, which would provide further evidence for the use of fire? What if stone artifacts or evidence of clothing are found? What if additional chambers are found with more bones in positions that suggest purposeful disposal? This would strengthen the case for the site as a burying ground, which Mitchell has downplayed. With so much of the cave yet to explore, it seems risky to claim that the bones must be apes. A close reading of the description of the cave environment reveals that more hominin bones have been identified in other places in the cave, but these have yet to be described. When these are excavated, I will not be shocked if tools are found in association with them, given what have been found in nearby caves. What if additional chambers are found with similar bones? Is there a creationist precedent for calling these bones “human”? Yes! Dr. Mitchell’s response to the South African bones clearly shows a large portion of her decision is based on the size of the skulls. The volume of the two crania recovered were estimated to be 465 and 560 cc which is very small compared to modern humans which average about 1330 cc (Berger et al. 2015) and Homo erectus with crania of volumes between 900 to 1100 and Homo habilis (610 cc). Australopithecines on the other hand have crania ranging from 410 to 493 (Berger et al. 2015) and modern chimpanzees average 370 cc. So these new crania are closer to chimpanzees than modern humans. 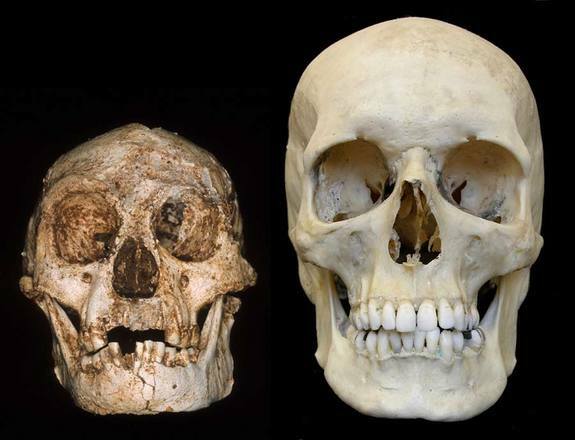 The “hobbit” Homo floresienses skull compared to the typical human skull o the right. However, Dr. Mitchell had a precedent for identifying these South African bones as human in origin, and that precedent was her own writing! She previously wrote that the hobbit specimen from Indonesia (Homo floresiensis), which has a cranial volume of just 400 cc, is fully human albeit a mutant: The occupants of Flores island, memorialized by a few unfossilized remains in Liang Bua Cave, were clearly human, as we have always maintained. That set of fossils has many other unusual features and has been frequently compared to species similar to Homo erectus. Interestingly, some scholars are suggesting that these new fossils from South Africa are also most similar to Homo erectus. Given the height, bipedal locomotion, head morphology, and hands more human-like than ape-like, Mitchell didn’t have to consider the small brain a deal-breaker given her acceptance of other individuals with small brains as being made in the image of God. One difference between the hobbit bones and these found in South Africa that I think has played a significant role in Dr. Mitchell’s decision making process is the presence or absence of cultural artifacts. The hobbit was tiny and although there was only a single skull found, there were part of several additional specimens that suggest there were many small hominids at this location. But the presence of stone tools, fire pits and butchered bones eliminated the “just an animal” option for the creationists. Here in this cave in South Africa no cultural artifacts have been reported. By dismissing the circumstantial evidence of the need for fire to get to this location and the disposal of bodies, there was no cultural evidence to tie these bones to individuals that would have the image of God and thus be fully human. As a result there wasn’t a smoking gun piece of evidence that forced her to define these bones as human. What does the future hold for Young Earth Creationists? Fast consolidation and fence building: Answers in Genesis has already taken a rather firm stance on these bones but ICR and others have given themselves some wiggle room. The latter could very quickly take the AiG position and quickly produce analyses that support that decision. Ken Ham has already written again in support of the position and offered some defense for why other YECs might disagree (see below). I expect that many other individual YECs and YEC organizations will take. UPDATE: see section above about ICRs more recent update. With ICR now taking the position that these are just animal bones I think this will be growing consensus in YEC community. Short term disagreement (months): Differences between viewpoints may be short-lived if Ken Ham’s viewpoint is seen as winning the popularity race, and other creationists either don’t want to risk offending the ten-ton gorilla and/or they wish to maintain the peace and purity of the YEC community they will gradually move toward the position articulated by AiG this past weekend. They will do this by offering a series of more detailed analyses that conclude that their initial gut reactions were wrong and that these bones are in fact just a group of cowering apes seeking protection from predators. Long-term disagreement (years): YECs could propose and maintain conflicting viewpoints on whether Homo naledi was fully human or just an ape. Those differences may be difficult to resolve if individual organizations have made strong claims for their views and don’t want to admit that they were wrong. Dueling articles could be published in their so-called peer-reviewed journals. Such a debate would not be unprecedented as there was a decade long struggle amongst creationists about whether plate tectonics was real or not and there is an ongoing divisive debate about where the Noahic flood rock boundaries are found in the geological column. All three approaches are fraught with danger but for different reasons. A quick strong consensus risks being proven wrong in light of new evidence. Even if that consensus takes months to come about, future discoveries and more thorough analyses even by some YECs like Dr. Wood could cause future conflict. YECs frequently play the diverse opinions of secular scientists off each other to foster the idea that a lack of scientific consensus means that none of the interpretations can be trusted. However, because they believe strongly that there are “no in-betweens” they will not be able to resist placing the bones on one category or the others lest they risk making the bones appear to represent something that does fall on a continuum. Given the fragmentary nature of the evidence and the fact that the only data we have to go on are the published descriptions written by those who believe there must be in-betweens, some creationists, as the article mentions, will have different opinions about this. That “article” he refers to is my first post on this topic. I would note that data will always be fragmentary so this will always be a factually accurate statement but as I said this before, this isn’t some partial jaw and a piece of toe bone. This is thousands of bones that are exceptionally well-preserved. There are a lot of details that have already been shared and the YEC scientists can look at many of those bones right now. The future will bring dozens of detailed descriptions of each set of bones from each part of the body. Ham also gives aid to the doubters in his audience by reminding them that these results can’t be trusted because of the assumptions of the scientists that made them. I am sure that Ham believes the bones are real but many of his followers will extrapolate from this that we can’t trust even the most basic facts that are being reported. I have shown there are plenty of Christians who are apt to just liken the whole thing to being a fraud and are comparing these bones to Piltdown man. Ham would like nothing more than to diffuse this story and having even the “facts” questioned distracts his audience from thinking through the implications of their very existence. Here is the National Geographic Story about how these fossils were found and some of the major findings that have been made. Below are the two original research articles. These are open access so everyone can view the results and discussion. « Bones of Contention: How Will Creationists Respond To A Huge New Hominid Fossil Find? I’m very curious how the dating will come out, which can be tricky in cave sediments. In particular, I wonder how differently some of these narrow cave passages might have looked at the time they were being navigated (e.g. could they have been wider, making the room slightly more accessible?). What to do? As I recently advocated in the journal Science, it’s about time paleoanthropologists acknowledged what a taxonomic and undefinable mess the genus Homo has become, and restudy the human fossil record without preconceived notions and the historical weight of overly used names. We must start from scratch, comparing in greater detail than usual specimens in order to see how they sort out, first into groups one might call by species, and then into larger groups we may give genus names to. It may be necessary to revive genus names that had been proposed early on, but what I predict is that we will see a picture of hominid taxonomic diversity that mirrors the diversity of virtually every other animal. Are you going to bring these skeptical voices in another article? I had read about Schwartz and his comments. That scientists will have competing hypotheses and takes on evidence is to be expected. The bones bring up many interesting questions and it is clear that Berger et al. have ideas about how to interpret the meaning of the data. Really, the disagreement is one of different schools of taxonomy and classification that have existed for some time and these debates go on about not just anthropology but all species. Are domestic dogs a different species than wolves are are they a subspecies of wolf? You can find quotes on both sides for that one too but it depends much on definitions and there is no agreement about what a species is. I teach a class in which we do nothing but discuss the definition of a species for the first three weeks. I’m a creationist but not a YEC. Whatever the case, your undue condescension toward the creationist position is noted. Frankly, your closed-mindedness doesn’t exactly fill us with excitement at the thought of engaging with you academically. Hi, thanks for the feedback. I do need to have someone remind me when I have lost the conversational tone that I have sought to have on this blog. While I stand by my analysis and think that it is important for people to see how YECs think and how it effects their analysis, I did include to many unnecessary jabs that do not elevate the conversation but rather could only create boundaries to it. I have revisited my article and made some changes. “Bible-believers know there can be no in-betweens.” Ham on 14 Sept. But there is quite a difference physically/morphologically between today’s great apes and what Ham calls a ‘fully human individual’ ie our species of Homo ONLY. Yet THESE bones look ‘human’ to SOME YECs and ‘non-human’ to OTHERS. Because their owners had BOTH human and ape/ape-like characteristics! I find this find interesting. I have recently started reading a lot on the origins debate (my normal area of interest is metaphysics and epistemology). I tend to lean in a “YEC” direction (not completely certain), but I do not understand why many need so much certainty. I kind of track with Wood on this find. I do not need a YEC view of creation, especially since I think the creation narratives clearly are structuring the creation of the world according to the Temple, so there are some really complicated genre considerations to take into account in understanding what they biblical authors are doing. That being said, I really enjoyed your summary. I have to hazard a guess that the quoted Facebook comment is a Poe, i.e., someone being sarcastic. Problem is, in an Age of Extremes like today, as crazy as you can get as a joke, there’s going to be some True Believers twice as crazy along the same line AND DEAD SERIOUS. The science deniers can’t agree. For them it’s either human or ape, nothing in between allowed. The fact that one group says human and the other group says ape shows that they don’t know what they’re talking about and they’re just making everything up. Atheist here who is fed up with religious extremists who disgrace the human race. These creatures who had hands and feet like humans and could walk erect like humans lived near the cave. With their brain which was not much bigger than a chimpanzee’s brain they were able to figure out it would be a good idea to remove the dead bodies. In my opinion they threw the corpses down the cave without any ceremony. Just guessing of course. An interesting thing about science is every discovery means new questions have to be asked. That’s what makes scientific progress possible and it’s a good thing. Fantastic time to be alive. Just this year we discovered mountains on Pluto and now this amazing discovery of one branch of the human family. One of many human-like creatures who went extinct. Only our species survived. Can these creatures be our ancestors? It’s another question that needs to be answered. I betting they’re not our ancestors but I can’t be certain about it. Science is awesome. Religion is boring. Reblogged this on anna5929's Blog. I’ve read a lot of Steven Jay Gould essays. Natural Systems seem to have a knack for “not easily fitting into neat and tidy interpretative frameworks”. Throwing a curve and swinging a sledgehammer at the science status quo. Let the evidence speak for it’s self. This is an ongoing investigation, drawing conclusions at this point makes no sense. I, being a convinced YEC , normally would gravitate to the Ken Ham position, however, even Ken has been known to jump to conclusions. The suggestion of “fraud”, whether having already occurred or likely to occur in future research, is not with out bases. The track records of non theist / evolutionary palaeoanthropologists is dubious at best. These creatures do not appear to be related to Adam pursuant to Genesis creation narratives, but obviously must fit into the first eleven chapters some where. I will wait for the best interpretation from the experts with least motivational predisposition. “even Ken has been known to jump to conclusions”. No he does not. He *starts* from his conclusions. In that article, in the second section, you state “this amazing find raises serious doubt about the Darwinian theory that apes and humans share a common ancestor” and “these researchers do not consider Lucy and her kin to be fully human, though there is much evidence to suggest so”. Are you an old earth creationist who denies human evolution? Strange, Mr Natural historian, but in the space of two articles you have neglected to reference the CMI response. Is it because their article does propose a ‘wait and see’ attitude, instead of a knee jerk reaction you’re claiming all these YEC’s tend to have? I found their article by Marc Ambler quite reasonable and considered. Of course they still take the line that the bones will be either fully human, or not. But that’s hardly surprising. Anyone who doesn’t believe (and I stress BELIEF) in evolution will say the same thing. By the name of this article I’ll presume you’ve read ‘Bones of Contention’. Most informed biblical creationists won’t be too concerned about these bones, the incredibly subjective nature of anthropology, as documented in that book, helps us to remember that bones, or fossils, will sing any song we want them to. By the way Mr Braterman – are you saying you don’t start from your own conclusions, or world view? 😉 You’d be lying if you said no! Hi, please note the dates of my articles. They are both before Mr. Ambler’s comments on CMI. It would be difficult for me reference something from the future. I may attempt to predict what they will say but I’m not good enough to reference their specific words before they say them:-) I expect CMI will follow Ham’s lead once they look at bit closer especially since they don’t have anyone on staff that is really qualified to make an expert opinion of the data from the original articles. I would have certainly have included the CMI response had it been there before I wrote. I’ve been busy but I will probably add a note to the second post to acknowledge they have responded. Thank you, an update to your article would be appropriate. I don’t know who at CMI will do the more detailed response to this find, however at a glance Lubenow majored in anthropology. Also bare in mind that CMI.has many Ph.D’s on staff, and seeing as how anthropology crosses over into a few fields, I think they’ll be able to stumble through! Ken Ham is definitely vocal and prominent, but CMI I think is the most authoritative of the Biblical Creation ministries. I infer that if God wrote Genesis 1:21, He made a deliberate mistake, to warn people against the abuse of the Bible as a science text. Ashley, had a read, don’t think there’s anything there that I can respond to. Your main thrust seems two-fold, to call all YEC ministries liars, and to ridicule them for disagreeing with each other. My only comment could be that secular scientists disagree at times also. I await the CMI detailed response, they are more authoritative than AiG or ICR. The difference is that YECs don’t know how best to deny science, and sometimes embarrass themselves as a result, whereas genuine scientists sometimes have honest disagreements over the interpretation of evidence. Paul I’m not confused at all. Evolution demands intermediate species between what we have now and what we speculate it came from. In the case of Homo sapiens, if we evolved from an ‘ape-like’ primate, there must be intermediary forms, or missing links. Unfortunately there aren’t many candidates. As time goes on each specimen is reluctantly set aside as either an extinct primate, or fully within the parameters of human variation. And so we’re desperate for missing links, evolution demands them. This then makes for bad science, bones and fossils are not scrutinised as closely as they should, the media is given the cup half full story, and voila, human evolution is a fact. And the scientist announcing this discovery, Lee Berger, has a reputation for, well, seeking headlines. In regards to evolution generally, I’m not going to get into a debate about whether or not it’s scientifically proven by all the ‘ologies’ you list. Only to say that a scientist without the evolutionary blinkers would look at the same data and come to a totally different conclusion. I had a brief look at that paper regarding whale evolution. It got very involved rather quickly, but a few quotes stood out: “Even in Darwin’s time, it was known that cetaceans had land ancestors, but fossils that recorded the transition from land to water were not known…” So then how was it known? Not from the evidence! Rather from a philosophical position. And another one: “In the past two decades, the origin of whales has gone from being based on barely any fossils to one of the best- documented examples of macroevolution”. To a cynic like me, that sounds like ‘we knew what fossils we needed, now we’ve inserted them’. Apart from that, a little googling has shown that many claims that the authors of the paper make aren’t actually scientifically justifiable. To finish off, God did write Genesis but i really don’t think he’d be deliberately misleading just to teach us a lesson. “Apart from that, a little googling has shown that many claims that the authors of the paper make aren’t actually scientifically justifiable.” Please be specific, with references (ICR and AiG don’t count here, as they are not and do not claim to be primary sources). As time goes on each specimen is reluctantly set aside as either an extinct primate, or fully within the parameters of human variation.” That statement is false. Or are you referring to the INSTANTANEOUS responses of committed creationist ideologues? I am having apparent technical problems adding the text of my email of 21 Sept here. Therefore I am now adding it at that BCSE discussion forum thread INSTEAD. As Ashley and Paul have pointed out, your claim about transitional forms having been “set aside” is patently false, and you provide no sources for anything. I personally think it’s even worse that you claim that someone looking at the evidence without evolutionary blinkers would come to different conclusions; the history of evolutionary biology bears out that evaluation of the evidence results in acceptance of evolution, and only strong scriptural presuppositions undermine this trend. Darwin and Wallace developed their ideas independently, and both were forced to accept their conclusions in spite of starting with a belief in some sort of divine Creation. Without starting with the assumption that God necessarily exists and created everything (and also without the assumption that he didn’t), the clear conclusion is that a model incorporating both common ancestry and descent with modification is the only feasible explanation. You see the change in conclusion that results from the absence of your own biases and mistake it for one that results from a largely fictitious set of biases you project onto biologists. Last night if I recall my latest comment was visible. Now it is ‘awaiting moderation’. I would be grateful for clarification. I had removed moderation a while back but yesterday put it back in place for all so it may take time for me to get around to looking at comments. This is an intriguing article and shared this with a few in my connections who have been posting the true and false evolution as I am going to tell him, “Wait a second there is something in between that.” I also said this to Victoria Jackson though what we all acknowledge is entirely controversial.